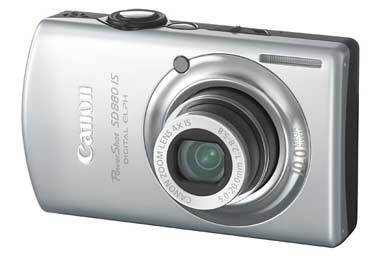 Canon’s PowerShot SD880 IS is a compact point and shoot digital camera. Part of Canon’s Digital Elph family, the camera shoots 10-megapixel photos, has 4x optical zoom, and supports ISO settings up to 3,200. The “IS” designation at the end of the name refers to the camera’s optical image stabilization mode. Easy-as-pie to use, the SD880 IS includes 11 special shooting modes, including Aquarium, Fireworks, and Snow. There’s also a high ISO setting for shooting action in low light situations without flash, though noise in the images becomes more noticeable as you use the higher ISO settings. The camera also includes macro modes that allow you to focus on objects as close as 0.8 inches away from the lens. This small, sturdy camera fits easily into a shirt pocket is attractively designed; the one I tested has a silver front and black back. It’s also available with a gold-colored front instead of silver. The SD880 has a large and vivid 3-inch LCD with a wide viewing angle. The photos looked great both on my display and in prints, with our standard test prints showing the camera able to capture both excellent colors and lots of detail. I found that the camera performed well in low light situations, and along with the image stabilization, I was able to forgo the flash in many situations-I found the camera’s flash to be a bit harsh in many shots. I was also able to go a few days between charges with the camera’s rechargeable lithium ion batteries. The SD880 IS also records video at 640 by 480 resolution, up to 30 frames per second. The movies look good, though nobody would mistake them as being from a decent camcorder. The movies are imported into and can be watched in iPhoto, and you can bring the movies into iMovie without needing a third-party QuickTime plug-in. If you’re looking for a good quality point-and-shoot camera. consider Canon’s PowerShot SD880 IS. It’s easy to use and small enough to fit in a shirt pocket, while delivering high-resolution photos with great color and detail.